I found that I didn’t feel quite so unproductive, because my mind was busy, and then I felt foolish for thinking that. Then I thought about writing about thinking about writing about sitting there. And then Clio said, “Man, you’re cramping my style. I’ve got some napping to be getting on with.” The mail came, but I didn’t bring it in because it’s only bills and advertisements. Then I went up to clean the bathroom, and thought about writing about that, but luckily for you I won’t do that. When I was little, I used to narrate my actions in my head in the third person. Not all the time, because that would be crazy! But often. “And then Claire sat on a bench in the middle of the room. She always got through with looking at paintings before everyone else. She did everything quickly. And now she sat and watched the people looking at the paintings…” And on an on it goes! I feel like I’ve been doing that again lately, because of The Ordinary. Not in third person now, so it’s slightly less eccentric. But when I cook, I’ll think about writing about it, and aboutexplaining how it’s done. And sometimes I’ll wake up in the middle of the night, and try to occupy my brain with whatever I might say on here the next day (explains a lot about the quality of the work, doesn’t it?) and I’ll find myself writing in my head. And, yes, this might seem crazy, but I think this is a good thing!!! I firmly believe that the more you write, the more you write. The more you think about writing, the more you’ll write, and hopefully it will become a habit. (This doesn’t guarantee good writing, mind you! It just makes it easier to get started.) I think this understanding extends to all things. The more you draw, the more you’ll draw. If you want to make movies, you should watch movies, talk about movies, take photographs, write movies, make shorts. The more you cook, the more you’ll think about cooking, and the more you’ll want to try new things and experiment with new ingredients, until you’ll get sick of it all and go out to dinner. If you want to make music, the more you listen to songs, and practice making music, and think about music, the more life will present itself to you as a song. Because even if writing and making movies and drawing aren’t important, which, arguably they’re not at all, I’d still like to go through life looking for things to write about (or sing about or draw pictures of.) Just as the actors that work with Jaques Tati started to see little comic pieces in everyday exchanges in the world around them, you’ll start to find that even small things are worth noticing and remembering and examining, which in some way makes life worth living. And now I feel foolish for writing about writing, so let’s talk about this dal instead. It’s made with red lentils, millet and sweet potatoes, and it’s cooked for some time, which makes it dense and soft and porridgey. Red lentils are nice because they cook quickly, but if you cook them longer, as (I believe) Indian dals are cooked, they take on a whole different life. I added spinach and peas to pep things up and provide a little texture. And I used beautiful black cardamom pods, which are so smoky and sweet (but watch out for them when you eat the dal, you wouldn’t want to bite down on one!) I decided that cumin was too obvious in this dish, so I left it out in favor of other sweet and smoky spices, like cardamom, nigella seeds and smoked paprika. The flat breads were quick and easy to make – they have a little pumpkin puree and a little ricotta, which gives them a nice flavor and texture, and they were just crunchy enough to provide a pleasant contrast to the soft dal. Here’s Station Showdown from the Yojimbo soundtrack, cause it’s all about the millet. Golly, this soundtrack is brilliant! In a large soup pot over medium heat, warm the olive oil. Add the shallots, garlic, bay leaves, pepper flakes and cardamom pods, and stir and cook until the garlic starts to brown – about a minute. Stir in the peas, spinach and butter. Cook till the peas are hot, then add lemon juice, salt, and pepper, and serve. In a large bowl, combine the flour, salt, baking soda and spices. Make a well in the center and add the pumpkin, ricotta and eggs. Stir to combine. You should have a soft but kneadable dough. You can add more flour or a splash of milk if it feels too dry or wet. Knead it for a minute or two, to be sure that everything is incorporated, and the set aside for about twenty minutes. Break the dough into four equal-sized balls. On a well-floured surface, roll each ball to be long and thin and about 1/3 inch deep. I fit four cross-wise on a (lightly buttered) baking sheet. Bake for fifteen to twenty minutes, till it’s golden brown and crispy, turning once or twice in that time. 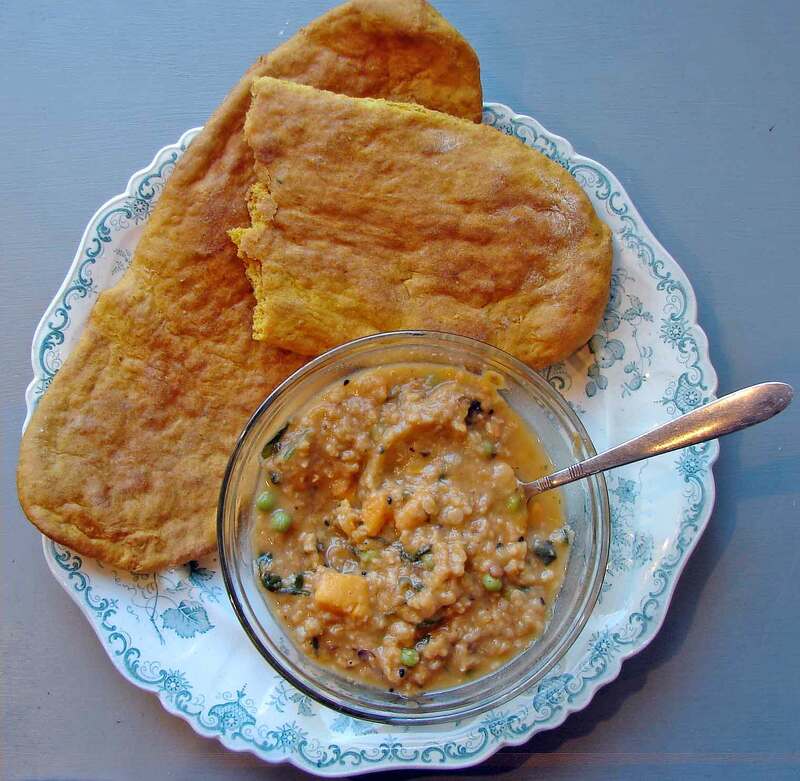 This entry was posted in beans, bread, recipe, Uncategorized and tagged dal, flatbread, millet porridge, pumpkin flatbread, red lentils by Claire. Bookmark the permalink. Thanks, TFD. Quality-ful is a good word. ALthough now I want a box full of quality street chocolates! Great sample! That is eatlcxy what I was looking for to improve the graphics of my 2d game. But the (bad) performance still remains a serious problem for me. In my game, the (scrolling)levels are much bigger as the one in the sample. Furthermore i also would like to add some more lights. I tried this within the sample and the result was like a slideshow I experienced that the most performance loss comes while drawing the shadowvertices (last lines of the DrawShadows method). Maybe merging all convexhulls shadows to one single buffer could help here. Also precalc the shadowvertices on specific events (eg. on new light, on new convexhull, on lightposition change, on convexhullposition change, on scaling light range ) instead of doing this each frame. Therefor an illumination manager class, which holds shadowvertices and manages all convexhulls and lightsources, could be helpfull. Just my thoughts. Any further ideas?